Tavares: "We want to become the most efficient carmaker ... not the largest." 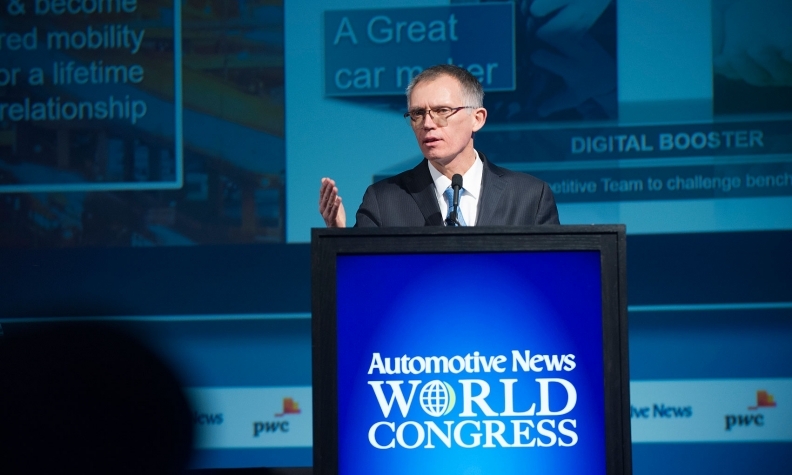 DETROIT -- PSA Group plans to bring electrified options to its full car and light-truck lineup by 2025, joining other automakers in pledging to widely deploy partial or fully electric powertrains to lower emissions, CEO Carlos Tavares. PSA will offer 40 electrified models across its five brands -- Peugeot, Citroen, Opel, Vauxhall and DS -- worldwide by 2025, Tavares said. Overall, PSA, which is preparing to return to the U.S., will launch 124 new models across six regions worldwide over six years, Tavares said. He declined to detail which brand PSA plans to market in the U.S. but said many future Opel models will be engineered to be compliant with U.S. regulations. PSA acquired Opel and Vauxhall from General Motors in 2017. The first vehicle destined for the U.S. is being developed by engineers at Opel in Russelsheim who are familiar with U.S. homologation standards, Tavares said. But he reiterated that PSA plans a phased entry into the U.S., beginning with mobility services and gathering data on American consumer preferences before it starts selling vehicles. Tavares said 80 percent of the company's vehicles will have the capability to navigate themselves under limited conditions by 2030, and 10 percent will have up to Level 4 and Level 5 autonomy. PSA is “confident” it can turn around GM’s former European operations, Tavares said, adding PSA plans to execute a similar strategy to restore profits at Opel as it did with PSA in recent years. A vocal supporter of agility vs. size, Tavares considers being able to quickly adapt the main reason for success in a global automotive landscape where chaos is the norm. In his vision, speed is key in a rapidly changing industry, so Darwinism is back. Tavares, 59, who has headed PSA since December 2012 and quickly turned around the automaker from a near-death experience -- producing a 7.4 percent operating profit margin in the first half of 2017 -- admitted that size gives just two advantages. The first is bigger purchasing power in dealing with suppliers. The second is higher volume on which to amortize product and technology investment. But size alone does not guarantee future success, because bigger organizations are slower to react and tend to become complacent. “The speed we need to adapt to is not chosen by us, but it is imposed by regulators and by changing consumer behaviors,” he said. In March 2017, PSA announced plans to acquire GM's unprofitable European operations, the Opel and Vauxhall brands, for $2.6 billion. “Turning Opel around is my priority No.1,” Tavares told Automotive News Group Publisher KC Crain. Despite PSA’s engineers disputing the notion that German cars are better than Citroens, Peugeots and the near-premium brand DS, Tavares admits that there are consumers around the world that won’t buy a French car, preferring a German volume brand because they see it benefiting from the reverberation of the cachet of German premium brands. “Opel is a German brand, its models will continue to be designed and engineered by German engineers, thus it perfectly fits our French brand portfolio,” he said. PSA’s current main weakness is not being in the North American market, and Tavares is hatching a 10-year plan announced in 2016 and will be completed by 2026 -- when it expects to be selling cars in the U.S.
“I was selling cars in the U.S. years ago and it was fun,” Tavares said remembering his years as head of Nissan North American operations. PSA started to offer mobility services in the U.S. last year and this year will launch car sharing in two to three big cities using vehicles from other automakers. “A 10-year plan gives us the appropriate time to properly understand this crucial market and launch the right products and services,” he said. By the time PSA relaunches U.S. sales, it also wants new innovative distribution models in place. While Tavares declined to say which brand PSA will use to re-enter the U.S., he said that a pickup is not on top of his priority list.